Once the garlic scape is ready to harvest (I wait until the stem has circled itself twice), cut it as close to the first garlic leaf as possible. Bring the harvest indoors and rinse them off under cold running water. Cut the flower head off and set it aside. They make a great broth! Then cut the stem into one inch sections. Place these sections into a food processor and chop. You want chunks not puree. Place the small pieces of garlic scapes from the food process onto a solid dehydrator tray. Make sure they are in a single thin layer and not piled up. Once you have all the scapes chopped and placed on dehydrator trays put the lid on the dehydrator and turn it on. For those who have a dehydrator with a temperature control on it, choose 95 degrees Fahrenheit. Otherwise choose the lowest setting. For those who do not have a dehydrator place the garlic scapes on a non-stick pan and dehydrate them using the lowest setting on your oven. 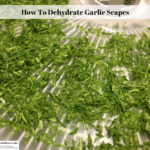 In a food dehydrator garlic scapes take at least 6 hours to fully dehydrate. They are done and ready for storage when the pieces of the garlic scapes easily crumble in your hands. They are still going to be bright green. Put the dehydrated garlic scapes in a glass jar or other sealable container. A freezer bag also works and is recommended if you intend to store them in the freezer. Date and label the container.